I did Photo101 in November 2014 and one of the prompts was “Water”. I posted a photo of water dripping from a tap where I caught the individual droplets in the frame. It was quite a popular post, you can see it here. This weekend has been a stormy and rain-filled one here in Brisbane, so I took a moment this afternoon (Sunday 22nd March) to do something similar and to demonstrate the effect of fast and slow shutter speeds. I was fully committed to this experiment, lying on the ground and getting soaked with the little flood that was forming from a gap between my patio roof and the house. Consequently, I took these photos quite quickly – I was getting drenched, I didn’t want my camera to get too wet, and I wasn’t sure how long the heavy rain would last. As usual, I used my trusty Olympus OMD EM5 camera. I attached the 60mm (120mm equivalent) lens. For my first experiment, I captured drops hitting my little pathway to my garden shed. 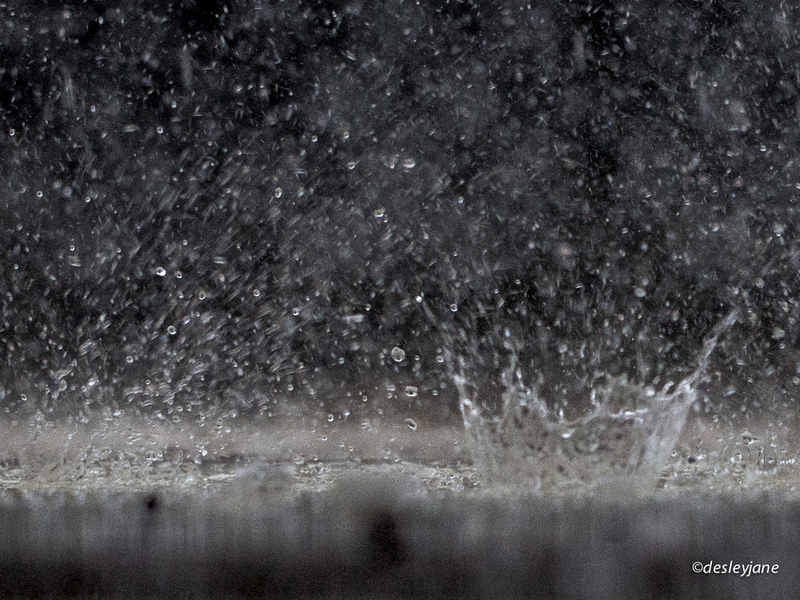 The first shot uses quite a fast shutter speed (1/1000th of a second) and you can see the drops hitting the pavers. The second shot uses a very slow shutter speed (the shutter was open for one second) and you can see that it looks like it’s not raining at all. At this point, I had to get up because I was getting soaked! For my second experiment, I attached my camera to my tripod and pointed it at my guttering. It was raining so heavily that the water gushing out over the top of it, the gutter couldn’t contain all the water. In the first image, the shutter speed is very fast (1/1000th of a second) and you can see individual droplets forming. In the second image, the shutter speed is very slow (1/15th of a second) and the water can be seen as a stream instead of individual droplets. My header image is one that I took and cropped quite heavily in Lightroom. It was shot at f/2.8 and at 1/1000s. I had to bump the ISO up to 400 for this one to brighten the image a little. I love the splash being made here. DJ, I love this, and I really mean it. It’s so interesting and beautiful. I do like how your mind works; it is inspiring. I was imagining you on the floor with your camera and wished that Gidget could have captured this shot as well. You should train her as photographer, how about that? Thank you Lucile! I wasn’t sure but I had fun doing it so thought it would be interesting. LOL yes GG needs to learn how to use an iPhone at least! Although she would probably call Teddy all the time. You’re most welcome. The photos are gorgeous. I have also been experimenting with water, shutter speeds and iso. Very helpful! Oh excellent, are you enjoying your experiments? Your photography has become insane! Absolutely amazing. A few drops of water & this happens. So symbolic of the worlds need of it & a reminder that we can not take it for granted. Oh thank you so much. It’s so much fun. Yes! Such an important resource. Wow, what amazing shots! Love them!